Ikkeri is a historical village in Karnataka. It is located at a distance of about 6 km to the south of the Sagara town in the Shimoga district. It was the erstwhile capital of the Keladi Nayakas. The word Ikkeri means ‘Two Streets’ in the Kannada language. Ikkeri was the capital of the rulers of the Keladi Nayaka dynasty for 120 years during the 16th-17th centuries. During their rule the Keladi rulers built temples, citadel and a palace in Ikkeri. At that time Ikkeri also had a mint that minted coins. A lot has changed since those ancient times and Ikkeri has lost much of its grandeur. But some traces of its glorious past exist even today in the form of the famous Aghoreshvara temple. 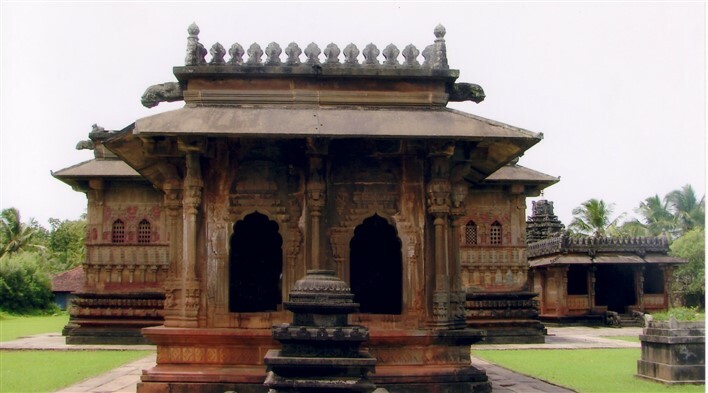 The Keladi Nayaka rulers of Ikkeri built magnificent structures during their rule. The structures of the Keladi period mainly displayed Hoysala-Dravidian style of architecture, as was prevalent during those times. Granite was extensively used for constructing the structures. Intricate carvings on the walls and ceilings of the structures were a common feature of that period. An outstanding example of their architectural prowess is the Aghoreshvara temple. Aghoreshvara Temple: It is a magnificent 16th century temple that stands as the most famous structure in Ikkeri. It is dedicated to Lord Shiva. The temple complex has a few smaller shrines dedicated to other gods as well. Rameshwara Temple: The Rameshwara Temple in Keladi is located at a distance of about 11 km from Ikkeri. The temple was built in the 16th century. It was built in the Hoysala-Dravidian style of architecture. Varadahalli: Varadahalli has the famous Shri Sridhara Swami Ashram that was built in the year 1954. The place is ideal for spiritual meditation. Varadamoola: Varadamoola is a picturesque location that stands at a distance of about 6 km from Sagar in Shimoga. River Varada originates from this place. Chandragutti: Chandragutti is known for the Chandragutti Fort and a temple dedicated to Goddess Renukamba, the mother of Parashurama. Jog Falls: Jog Falls is the second highest plunge waterfall in India. It is also known as Gersoppa Falls or Jogada Gundi and is a major tourist attraction of South India. The best time to visit Ikkeri is during the months of September to January. Ikkeri is situated at a distance of about 353 km from Bangalore. The place is well connected to the nearby town of Sagara. There are several means of reaching Sagara and then proceeding towards Ikkeri. The nearest airport to reach Sagara is the Mangalore International Airport that is located at a distance of about 142 km from the town. Cabs can be hired to reach Sagara from the airport. The Sagar Jambagaru Railway Station connects Sagara to various cities and towns of Karnataka and beyond. Auto-rickshaws are available to travel between Sagara and Ikkeri. Frequent buses connect Sagara to major towns and cities in Karnataka. There are KSRTC buses as well as private buses that ply between Sagara and the nearby places. Local means of transport are available between Ikkeri and Sagara.